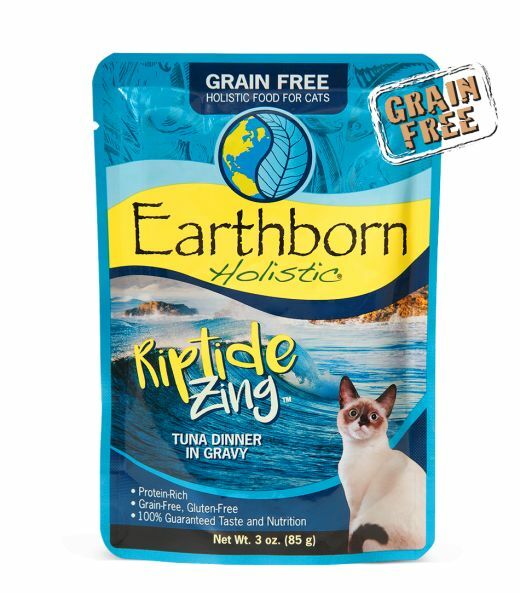 Earthborn Holistic® Riptide Zing™ Tuna Dinner in Gravy is an excellent source of high-quality protein for adult cats. Bring a wave of flavor to your cat’s next meal with this grain and gluten-free recipe from the deep blue sea. Tasty tuna in a savory gravy makes this formula a perfect dinner for any cat. Tuna, Tuna Broth, Tapioca, Sunflower Oil, Tricalcium Phosphate, Salt, Guar Gum, Potassium Chloride, Taurine, Celery, Niacin, Vitamin E Supplement, Zinc Oxide, Iron Proteinate, Thiamine Mononitrate, Vitamin B12 Supplement, Sodium Selenite, Manganese Sulfate, Vitamin A Supplement, Calcium Pantothenate, Riboflavin Supplement, Pyridoxine Hydrochloride, Copper Proteinate, Biotin, Vitamin D3 Supplement, Folic Acid, Potassium Iodide, Menadione Sodium Bisulfate Complex (Source of Vitamin K).